July 26, 2006, LG Crabo. 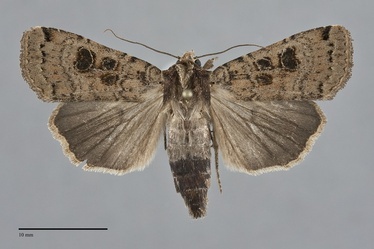 Xestia plebeia is a dull olive-gray medium-sized noctuid moth (FW length 16 - 18 mm) with light spots with dark filling that extends beyond the outer margin of the pale outline. It flies on both sides of the Cascade Range during summer and early fall. The forewing ground color is is usually medium-dark olive-gray with scattered darker scales, but some specimens have a slight orange cast across the entire wing. The basal, antemedial, and postmedial lines are gray, double, and fairly smooth. Portions of the lateral component of the antemedial line is black near the orbicular and claviform spots. The faint pale subterminal line is preceded by a row of short black wedges between the veins, largest near the apex where they are fused into a dark transverse bar. The three spots are similar, pale, and filled with dark brownish black that exceeds the outlines of the spots onto the adjacent wing. The orbicular and reniform spots are fairly large and the claviform spot is short but wide. The hindwing is medium gray-brown at the base and darker gray toward the margin, with faint gray discal spot and veins and a lighter ochre to reddish fringe. The head and thorax are usually darker than the wings, either gray-brown or slightly reddish brown. The male antenna is bead-like. Xestia is a large and diverse genus found throughout temperate, alpine, and arctic portions of the Northern Hemisphere. The genus is subdivided into three subgenera, Xestia, Megasema, and Pachnobia, by Lafontaine (1998). The genus is defined by a thumb-like ventral extension called the pollex which arises from the base of the clasper of the male valve. Xestia plebeia is classified in the subgenus Xestia. 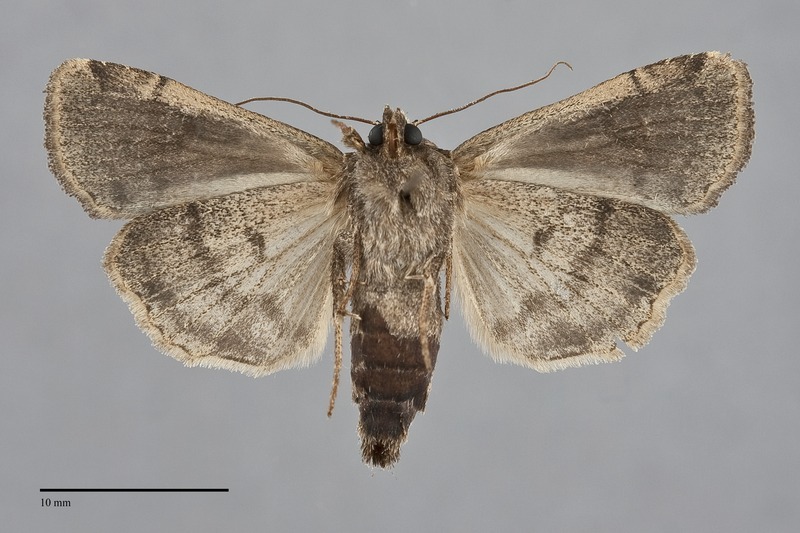 The type locality of Noctua plebeia Smith is Vancouver, British Columbia. This species is widely distributed in moist forest and riparian habitats. In the Pacific Northwest, it is usually rare and sporadic in coastal rainforests, mixed hardwood forests, oak woodlands, riparian zones along creeks and rivers, and in mixed hardwood-conifer forests at low to middle elevations west of the Cascades. It also occurs sporadically in spruce-fir forests at high elevations along the summit of the Cascades. East of the Cascades, it usually occurs in riparian zones along creeks and rivers. Xestia plebeia is most common in the western part of our region from southwestern British Columbia south to southern Oregon. It also occurs east of the Cascade Range in southern British Columbia, most of Washington, northern Idaho, and western Montana. It has not been found in eastern Oregon or southern Idaho. The range of this species is limited outside of the Pacific Northwest. Single records are shown for Utah and Colorado in Lafontaine (1998). It also occurs in California as far south as the central Sierra Nevada and the San Francisco Bay. This species feeds on many kinds of hardwoods in such families as the Rosaceae, Betulaceae, Ericaceae, and Salicaceae. It may have a preference for willows (Salix spp.) based on the habitat. Adults fly in summer and early fall. Our records span early July through September. It is nocturnal and comes to lights.